Yesterday morning, I knew I had to get up. My alarm had gone off several times, and it was calling me out of slumber. As I officially woke up, I suddenly had the thought: “We’re on the radio. I just know it. What if I don’t turn on the radio and I miss us?” 🙂 Suddenly wide awake, I flipped on my radio, tuned to KTIG 91.5 (MCBI/KCFB), and heard several familiar voices going into the transposed chorus of “Leaning on the Everlasting Arms”. Then, this morning, we all were up before 7:30 a.m. (nowadays a rare feat for us “older” people!) and sitting around a card table with headphones all on our heads, gathered around the home/cell phone (it’s our way of doing conference calls), listening to a local radio announcer introduce us to the listening audience of KBEK 95.5. He, our family, and the promoter, Pat, of our concert at Siloa Lutheran Church took part in a radio interview about the upcoming concert on May 1st (for more info about this concert, click here). That was a fun experience as well, and after the interview, the radio played “Were You There”. I always wanted to be on the radio, but as an announcer. (Ben, Leesha, and I would use my old karoke machine to record radio broadcasts for KHFT – Kids Having Fun Together – and had a blast pretending to be DJs! Oh the memories…) But, the Lord has taken the dream further, and surprised us with different radio ministry opportunities. What a neat outreach for our ministry! We pray people are blessed by our music and God’s message. It’s amazing to see where the Lord is leading this little group from Braham; we continue to be excited about His work through us, and are content to be wherever He leads us. We don’t desire to be anywhere we are not supposed to be, and we will continue to be the best we can be wherever we are. But that’s another post for another time. 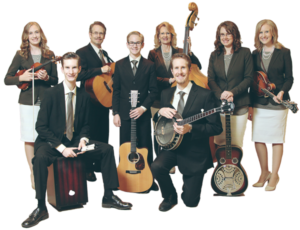 Oh, and here’s another thing for sharing: Great Adventure Gospel Band to play at Siloa – you may enjoy this newspaper article, especially if you haven’t heard our “Great Adventure” story and band beginnings in a nutshell. Luke Reiter, writer for the Isanti County News, came to our home to do a feature article a while back, and while the new article is very similar to the first, it still gives you a very concise and well-written synopsis of who we are and what God has done in our lives. Have a great, God-blessed day!